A family owned, full service company with over 30 years of trusted experience. Morton Septic Service Inc., is a locally owned, licensed contractor & septic company that does it all! Born and raised in Southern Central California, working for his father in their family owned construction company. He earned his class A truck drivers license at 17. Graduated San Jose State University (SJSU) with a Bachelor of Arts degree for Teaching in Industrial Arts and a Drafting major. Rocky taught at Leigh High School for 12 years, focusing in metalshop, woodshop, drafting and math. 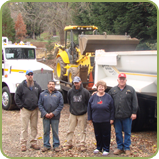 In 1978, he obtained his Septic Contractors License and started Morton Backhoe Service. He retired from teaching, becoming a full time contractor in 1982, incorporating in 2001. Rocky works closely with San Benito and Santa Clara County inspectors. Rocky's son, Gary joined the business fulltime in 1995. - Member of South Valley Sportsman Club for about 30 years. - Member of Morgan Hill Fish & Game. Rocky is an avid hunter and enjoys duck hunting at his duck club in the central valley. Rocky is known for being a straight-forward, honest and reliable person. Born and raised in the Oil Fields of Taft, California, Donna graduated from Gavilian College and raised 3 successful sons, Larry, Gary & Rusty, who all graduated from Live Oak HS in Morgan Hill. Donna was a teachers assistant for 17 years at Nordstroms Elementary school, originally at the Old Morgan Hill School. She has held the role of secretary and bookkeeper of the business since 1978. Donna is friendly, informative and a very helpful resource, who puts customers first. Born and raised in Morgan Hill, California, Gary graduated from West Valley College with an AA in Construction. He has worked for the busines since 1995. Gary and his wife, Kris have three daughters, Tabitha, Savannah & Marsela. Gary is an extremely experienced backhoe operator, with a Class A truck drivers license. Gary is responsible for most of the installation jobs and repair work. He is highly knowledgable in the Septic System Field and is more than capable of handling any of your business needs as Vice President.